Is there any particular way to find the “easy” questions to answer? Right now, I am student of pre-calculus. I am still studying basic calculus (derivatives & integrals) just because - well why not, it helps me get a head start. But as you can imagine sometimes I don't quite "get" it, and as you can see from my questions, they are mostly based on my lack of understanding of the particular subject at hand. I really, really want to thank the community for helping me to really grok these concepts, and for their friendly attitude towards my admittedly, very naive questions. However I want to pay it forward and maybe answer some questions. But here's the key point - there's no real way to be able to find questions that are within some scope. Sure, I can look at all the questions tagged calculus or derivatives or maybe even implicit-differentiation, but there are barely any questions which I know at my current level of knowledge. And of the rare times I do find one, there's almost always a good, well-thought out answer for it already. So my question is: While I may not be able to provide the best, or even the most correct, answers in the world, is there any way for me to be able to find questions at my current skill level quickly? And if such a thing does not exist, should we possibly add it? On the right side of the your screen near the top-ish (a little bit down) should be a "Favorite Tags" button, where you can click edit to add the tags to questions you are most familiar with. When browsing through questions, questions with tags that match your "Favorite Tags" other than if you are searching specifically through one of your tags, will appear blue. You may also find "Related Tags" useful for finding new tags that relate to material you already know. Personally, the algebra-precalculus tag is probably the easiest tag, but it may include material from questions where it may not have been so obvious what tag should go with it. Some things that are not so directly related to this tag, like the top question in the picture above, may appear. The top questions under "featured" "frequent" "votes" or "unanswered" may be difficult, but they are interesting to read and often involve high quality answers/questions you may be able to learn from. Not the answer you're looking for? 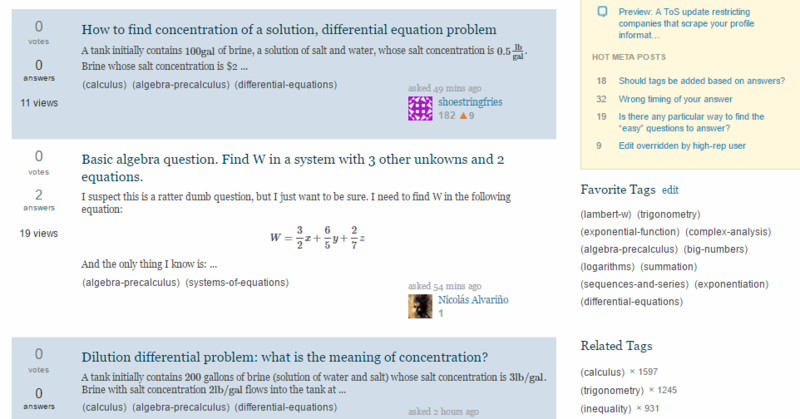 Browse other questions tagged discussion feature-request search . Where can I find questions I can answer as a high school student? How do I contribute to the site? Tags derivatives, integral, limit only for computation questions? Is there an easy way to access the revision list of an unedited question? Is there a way to find out when the traffic on math.se is the heaviest? Is there any way to recover my past questions? Is there any way to request an answer from a particular user?